In January, QNAP launched the TVS-x71 Series Turbo vNAS. Aimed at the top end of the SMB market, the TVS-x71 series consists of four, six and eight bay models available with numerous options with processors including Pentium, Core i3, Core i5 and core i7 processors. These high-end NASes are designed to operate multiple virtual machines using QNAP's Virtualization Station, and can transcode videos either on the fly or offline. With built-in Intel HD graphics, the TVS-x71 NASes are 4K UHD ready and can stream video from the built-in HDMI port. To ensure the network interfaces aren't a performance bottleneck, each TVS-x71 is equipped with 4 Gigabit Ethernet ports. There are also two expansion slots that can expand network capacity up to an additional four Gigabit or four 10 Gigabit Ethernet ports. Each of the models uses DDR3 RAM and supports up to 16 GB. The table below summarizes the three TVS-x71 models and processor/memory options. This review will focus on the TVS-471-i3-4G four bay NAS with an i3 processor and 4 GB of RAM, currently priced at $1089. The Pentium G3250-based TVS-471-PT-4G model is priced $100 less at $989. In this review, I'll be using the ASUSTOR AS7004T for comparison. Like our TVS-471-i3-4G review unit, the ASUSTOR AS7004T also uses an Intel i3 3.5 GHz processor. However, ASUSTOR uses a Core i3-4330, and the QNAP uses a Core i3-4150. Also, in this review I'll be presenting 10 Gigabit Ethernet results. The callouts below show the front and rear panel of the TVS-471. The front panel has LED indicators for status, USB, LAN activity and individual indicators for each drive. The front panel features key-lockable disk trays, LCD information display panel, USB 3.0 port and One Touch copy button. The rear panel has four Gigabit Ethernet ports, 2 USB 2.0 ports, 2 USB 3.0 ports and 4 Gigabit LAN ports. As you can tell from the AC power connector, the power supply is built into the TVS-471. Of special note are two PCIe expansion ports. We used one of the ports for an optional dual-port copper 10 Gigabit Network Expansion card QNAP supplied. The expansion card, model LAN-10G2T-D has a list price of $429. If you need only one 10GbE port, other options are the single copper port LAN-10G1T-D at $220 and SFP+ port LAN-10G1SR-D at $170. The TVS-471 proved to be difficult to disassemble, so we weren't able to detail individual component part numbers as we normally do. However, to summarize the key components, the TVS-471 uses an Intel Core i3-4150 processor running at 3.5 GHz and has 4 GB of DDR3 RAM. The spec sheet indicates that there's 512MB USB DoM Flash. Most likely, the 4 Gigabit Ethernet ports are provided by a pair Intel WG1210AT dual port Gigabit PHYs. QNAP uses a single operating system for all of its NASes. The current version of QTS is 4.1 (Version 4.1.4 tested). Last year, we published a full review of QTS 4.1. In addition, while browsing the QNAP site, I found an extensive (64 pages) datasheet on the TVS-x71 series. It's well worth downloading. To give you a feel for the user interface, below is the landing page from my review of QTS 4.1. Power consumption with four 3 TB WD Red drives we supplied drives was 39W (active) and 26 W (power save). RAID 10 rebuild time was a 7 hours and 10 minutes for a 4 X 3TB configuration. Fan and drive noise was rated as medium low; mostly drive noise. It was noted that there was a fan spinup to high during RAID 10 formatting due to high drive 3 temperature. Firmware version 4.1.4 Build 20150804 was loaded onto the TVS-471-i3-4G and performance tests were run using the Revision 5 NAS test process. All tests were run using Western Digital Red 3 TB (WD30EFRX) drives. The benchmark summary below shows test results for both a Gigabit connection (left) as well as corresponding test results where the client and the TVS-471-i3-G4 were connected to a 10GbE switch (right). We often comment about our test results being limited by the bandwidth of a single Gigabit Ethernet connection. We don't test with link aggregation, because it doesn't increase bandwidth for a single client. Only a "bigger pipe" in the form of 10GbE can break the bottleneck. Comparing the Gigabit and 10GbE results below, the most significant difference is in the File Copy tests that use large sequential files. With a Gigabit connection, many of the test results for File Copy Read and Write were between 109 and 110 MB/s. With 10GbE, the same tests produce results 3 - 5X higher. Table 1 summarizes File Copy benchmarks for RAID 0, 5 and 10 with Gigabit and 10GbE connections so you can see the performance difference more clearly. We don't include 10GbE results in the NAS Rankings because not all products support it. And because we don't have many 10GbE products in the Charts, we don't have a separate Ranker for them. So to provide an idea of the TVS-471's relative 10GbE performance, we'll have to resort to the good old File Copy composite charts. Note we went back and got 10GbE results for the TVS-463 that were not in the review, by using the same QNAP 10GbE adapter. The one below shows five products, with NETGEAR's ReadyNAS 716 turning in highest performance for RAID 0 and 10 File Copy write and read. The TVS-471 isn't far behind for RAID 0 write at 548 vs. 587 MB/s. But even though it's in the second slot for RAID 0 read, the TVS-471's actual performance is significantly slower than the NETGEAR's at 394 vs. 694 MB/s. The results also show the ReadyNAS turning in the slowest RAID5 performance and the TVS-471 the fastest at around 345 MB/s. For Performance Ranking, which takes into account only Gigabit Ethernet performance, I filtered for RAID 5 class NASes and Revision 5 Test Method. The ASUSTOR AS7004T still retains the #1 ranking based on performance, but QNAP holds onto rankings 2 through 4 including the #2 ranked TVS-471-i3-G4. Drilling down into the performance of the three NASes allows us to look at individual and category comparisons. The composite chart below shows the detailed performance for the QNAP TVS-471-i3-4G (left), ASUSTOR AS7004T (center) and the QNAP TVS-463 (right). The QNAP TVS-471 had category wins for Write benchmarks and Mixed Read Write benchmarks. The ASUSTOR AS7004T tied for #1 on Mixed Read Write as well as for iSCSI. The ASUSTOR was also slightly better for Read benchmarks than the TVS-471. It also won the Backup category - mostly because the relatively low Rsync score on the TVS-471. And while the TVS-471-i3G4 ranked #7 for the Video category, if you check the video results for the 10 Gigabit Ethernet tests above, you'll see that for both playback/record and playback, it scored well above 300MB/s. The NAS Charts have gotten pretty top-heavy, with well over a dozen products showing NASPT File Copy throughput over 110 MB/s. It's a good bet many of these could benefit from having a 10GbE port to deliver significantly higher throughput for a single client. While it's nice most of these chart-topping NASes have multiple Gigabit ports, link aggregation helps only when multiple clients are simultaneously hitting the NAS. Only 10 Gigabit Ethernet will help break the Gigabit barrier for a single client. But 10GbE remains expensive, with the cheapest single-port copper 10GbE NIC currently around $240. So the incremental price to add a single 10GbE client to the TVS-471 would be slightly less than $500, if you used QNAP's single port copper card vs. the dual-port supplied for this review. That said, sorting the NAS ranker by Total NAS rank shows the $1070 ASUSTOR AS7004T tops the charts with the #1 rank. 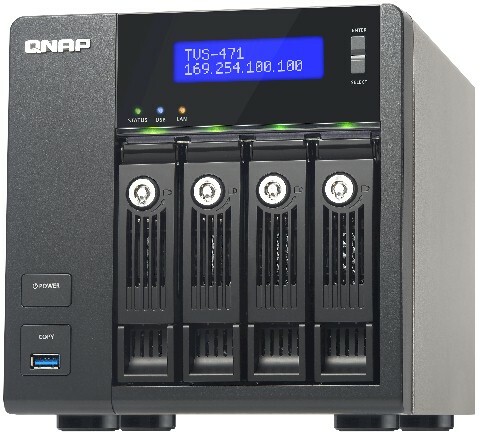 Right behind it and ranked #2 is the $1089 QNAP TVS-471-i3-4G covered in this review. Just looking at the numbers and pricing, it would seem the two products are fairly similar. But the ASUSTOR has only two Gigabit Ethernet ports, no PCIe expansion slots and lacks 10 GbE. In contrast, the TVS-471 has four Gigabit Ethernet ports built in and can have both more Gigabit and 10GbE ports added, thanks to its two PCIe expansion slots. All it takes is more $. Another consideration is virtualization. the QNAP TVS-471-i3-G4 has the built-in Virtualization Station that's compatible with the major VM manufacturers (Citrix, Microsoft, and VMWare). When connected to a USB keyboard and mouse and an HDMI monitor, the TVS-471's QVM Desk turns your NAS into an office PC that allows you to use VMs running Windows, Android, Linux and Unix. In the end, you don't always make a purchase decision solely on the performance Charts. Four built-in Gigabit Ethernet ports, two PCIe expansion slots for more network bandwidth and virtualization features make the TS-471-i3-G4 my pick as the four bay top-end SMB NAS to buy.